I have liked the idea of stirling engines from day one. To refresh your memory, a stirling engine is basically an external combustion engine or more specifically an engine that runs off any external heat source. The only one available (until now) was the Whispergen heater which produced electricity as a byproduct. I've had information about it in my book, Electricity - Make it, Don't Buy it from day one. Why? Because it was the only commercially available stirling engine that was not a demo or a toy. The biggest problem with Whispergen is they are not available in the US. Well - it's about time! Someone has actually gone out and put together an eBook that shows you exactly how to build a stirling engine yourself along with the parabolic reflector to power it. As I mentioned earlier, a stirling engine can be run by any heat source like natural gas, methane, kerosene, or solar. I personally would try a large fresnel lense (large sheet magnifying lens) to power it. I'll be honest with you, these alternative energy eBooks are usually scams and I don't refer people to them often because of that fact. I'm sure you've seen the Tesla Energy Secrets, magnets for energy, and many hydrogen booster scams being hawked to unsuspecting buyers. Either these schemes are outright scams or they put out only a few microwatts of power which couldn't even run a standard light bulb much less your whole house as they falsely claim. But this eBook actually has some workable, useful information in it. And the scale is workable at the home level and not either too small or only available on a very large and expensive scale for utility companies and large buildings. Can you actually build one yourself? The answer is a qualified "yes"... as you can imagine, building an engine and parabolic reflector in your garage is going to take a little bit of mechanical and carpentry skills. But all the information to do it is in the eBook. They even include DETAILED SCHEMATICS that are actually professional CAD drawings - these Computer Aided Design plans can be brought to any machine shop and they can produce the part for you. Some of the parts are easier to acquire or make and a few require more skill. They could probably assemble the whole thing for you too but it would cost more of course. 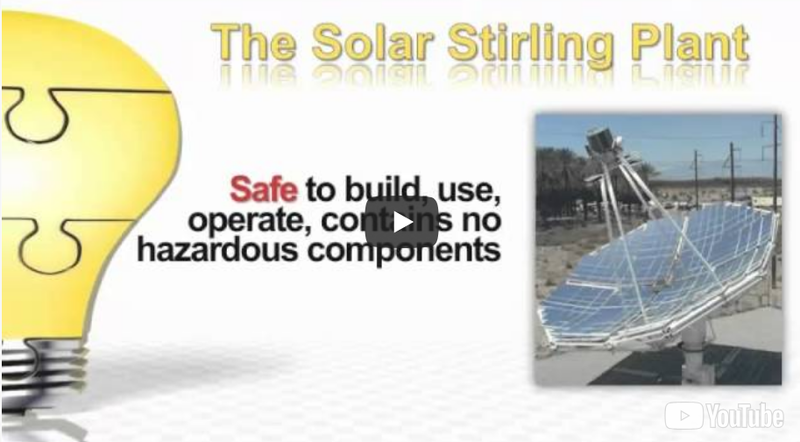 I could go on and on about stirling engines, but why don't you just watch the short video at the Solar Stirling Plant site and check it out for yourself? !